I highly recommend trying out the zesty-sugary rim on the strawberry and mango margaritas. The classic margarita really needs the salt contrast although this is personal preference. Quick instructions on how to make simple syrup as well as a note about fruit variation and types of tequila and orange liqueur can be found at the end of this hub. 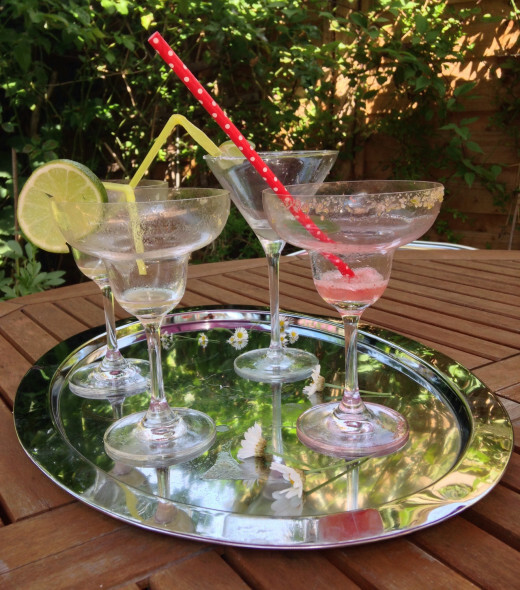 So how will you get your mouth around the sugary or salty rim whilst trying to remain dignified? Sometimes the lips just have to be licked! For the strawberry and mango margarita’s I like to use a sugary lime combination for the rim. In itself it is very lip lick-able and really compliments the margarita. Zest a lime onto a plate and leave it to dry out for a few minutes before adding a spoonful or so of coarse or granulated sugar. Mix it together using your fingertips. 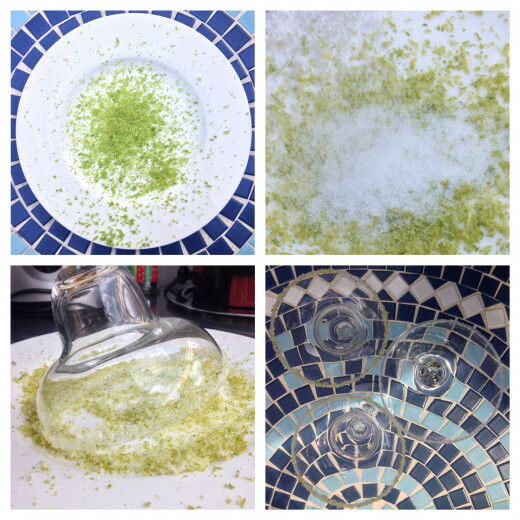 Wipe a lime around the edge of the glass so that the rim is moist enough for the sugar and zest to stick to but not saturated so that it congeals. I slice a very small slit in the middle of a wedge of lime, slot it on the margarita glass and slide it around so you get an even moistness around both the inside and outer circumference of the glass. Invert the glass and dab it into the sugary zest repeatedly. Twizzling the glass so as to get maximum coverage. The more ice you add the slushier the cocktail becomes. At the same time the volume increases and the overall flavour and, more importantly, alcohol gets diluted. 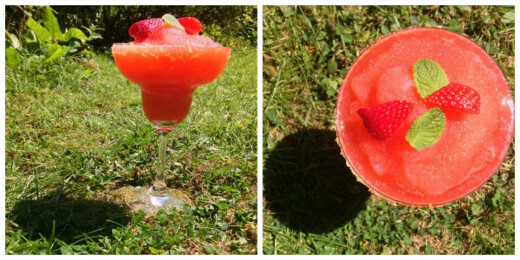 The tenderness and ripeness of your strawberries will determine the sweetness of the margarita. Once you have blended all of the ingredients taste a little to check it is up to scratch. If your strawberries are bitter then you may want to add more simple syrup. 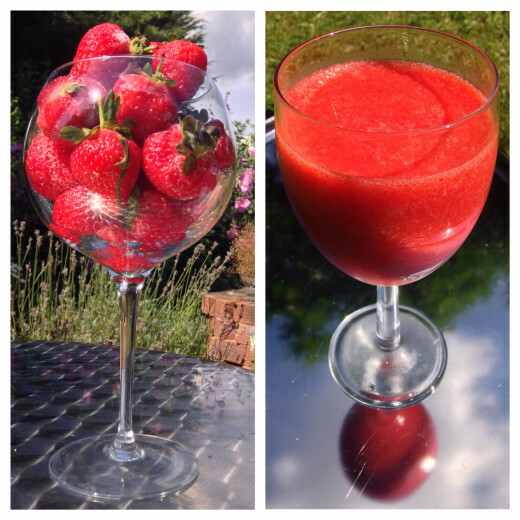 If you opt for frozen strawberries rather than fresh you will need less ice and the drink won't be as watered down. 60g fresh strawberries plus one to garnish. Prep the rim of the glass either by following the zesty-sugar steps above or else if you just want a sugary edge then wipe the rim with a lime and dip the rim into a plate of granulated or coarse sugar. Add the strawberries to a blender and puree until smooth. Juice the limes until you have about 20ml of juice. Add the ice, tequila, triple sec, lime juice, sugar and strawberry puree to the blender. 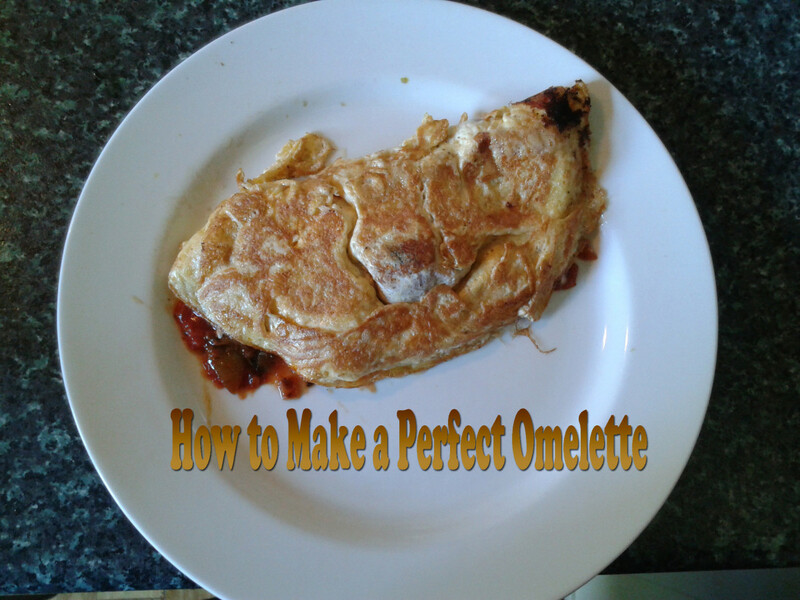 Once all the ingredients have been blitzed check the consistency and taste. Pour the margarita into the glass. If you have made it slushy you can form a little peak in the centre which looks the part when presenting to guests. However, this melts fast and then starts spilling over the edges and ruining the sugared edge! So if you do this then serve/drink it quickly! Add a strawberry to garnish. In the photo I have also added a couple of mint leave for added prettiness. If you have the space in the fridge or even freezer for a couple of bottles of spirits and a few mango slices you can use less ice and intensify the flavour of the cocktail. Prep the rim of the glass with your edging of choice, zesty, sugary lime or sugar by rubbing a lime around the edge of the glass and swivelling the glass in the sugar. 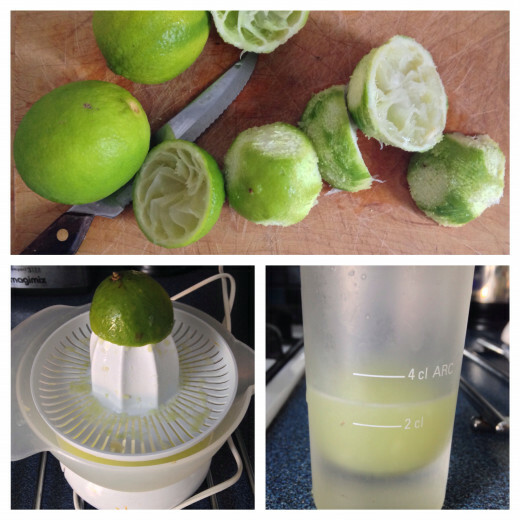 Juice the lime until you have around 15ml (a tablespoon). Add all the ingredients to the blender leaving the ice until last. 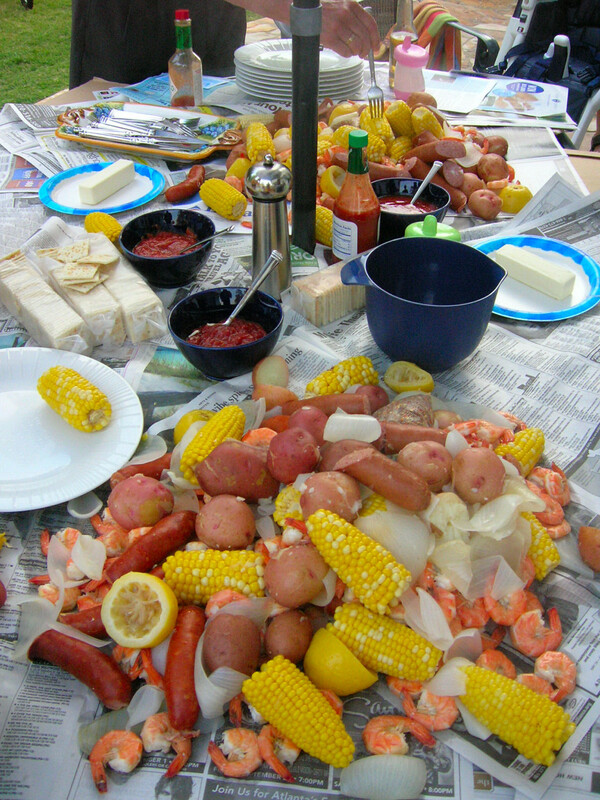 This way you can assess the quantity needed more easily as it will depend on the temperature of the other ingredients. They will probably be room temperature and need a good handful or two of ice to cool down cocktail and a bit more to make it a frozen mango margarita. Once all the ingredients are blended completely and the cocktail consistency is to your liking pour the mango yumminess carefully into your prepared margarita glass. Serve immediately! I piled the slushy margarita mango a little too high perhaps and the heat of the sun immediately went to work on it while I desperately attempted to take pretty pictures! If the taste of this cocktail is a little overpowering you can always add a little simple syrup to sweeten it or even a squeeze of agave syrup. If the cocktail isn’t cold enough for your taste you could always add an ice cube or two. 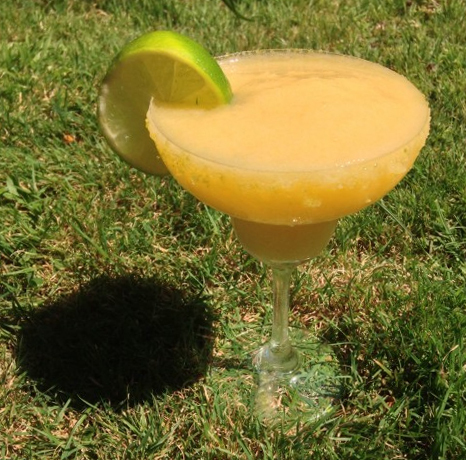 In fact if you wanted to turn the classic margarita into a frozen classic margarita simply add the ingredients to the blender rather than the shaker and add a load more ice. For the classic margarita I have opted to use a martini glass! I don’t have an especially good reason for this I just feel that it looks better. Wipe the edge of the glass with lime. Scatter salt onto a flat plate and dip the rim of the martini glass in as many times as it takes to get an even, salty edge. Juice the lime until you have produced about 35ml of liquid. Pour the tequila, triple sec and lime juice into a cocktail shaker. Shake vigorously until the outside has frosted, about 15-20 seconds. Strain the classic margarita concoction into your prepped glass. 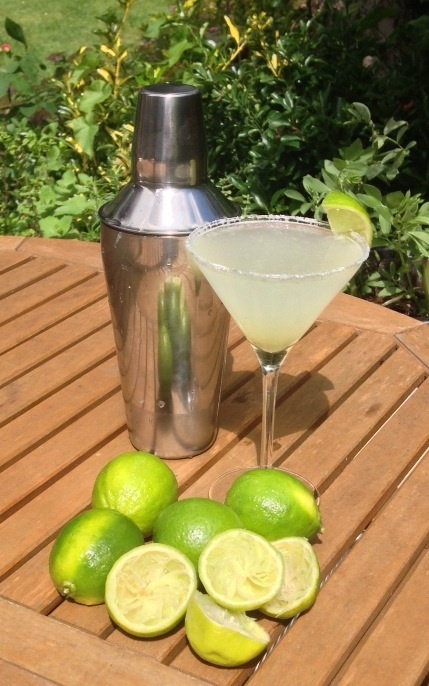 Add a wedge of lime to the rim to decorate. Add equal amounts of sugar and water to a small saucepan, for example 1 cup sugar + 1 cup water or 1 tablespoon sugar + 1 tablespoon water. Heat until all the sugar is completely dissolved. Cool in the fridge until required. In hot beverages sugar dissolves and combines with the drink quickly but in cold or frozen liquid it takes time and alcohol further inhibits the process. So using simple syrup gives instant sweetness to a cocktail. With a Margarita it’s all about the tequila. Any old tequila just won’t do. 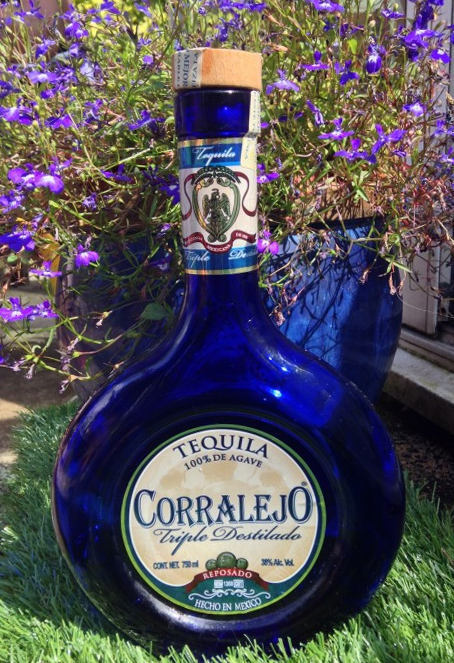 I had only ever tried a very popular brand of low grade tequila up until I went on a date with a Mexican who had recently arrived in the country. He offered me a shot from a bottle of tequila he had brought with him from home and I obligingly accepted. Wow. I couldn’t believe that this was the same stuff as the grim, gold liquid that I begrudgingly knocked back with my friends of a Friday night. Of course, that’s the whole point, it wasn’t the same at all! Check that “100% de Agave” is inscribed somewhere on the bottle. If this isn’t present then the likelihood is that up to nearly a half of the tequila is actually fermented cane sugar. The manufacturers use words like “gold” in the name to masquerade the low quality drink but in fact this is just caramel colouring that has been added to colourless tequila to make it appear more authentic and appealing. Although the consistency of tinned mango can be relied upon to be pretty constant the limes and strawberries can vary enormously in taste. Bear this in mind when making your margaritas. Adjust the sugar quantity accordingly in the strawberry margarita or mango margarita and for the classic margarita when, generally speaking, sugar isn’t added you may want to use slightly less lime juice if your limes are particularly sour tasting. If you have perused many margarita methods you will have noticed that some recipes call for Cointreau and some triple sec, a few even specify Grand Marnier but which spirit should you choose? Triple sec is a liqueur made from the skins of oranges and ranges in alcohol content from 15% to 40%. Triple sec actually means triple distilled and isn’t a brand name whereas Cointreau is. Cointreau is a triple sec but is thought of as higher quality (it certainly is more expensive). The difference in taste between a triple sec and Cointreau comes about because of the type of oranges used as well as the process of turning the orange into a liqueur by adding alcohol, sugar and water, which is similar but not the same! Grand Marnier is an orange based liqueur but it is also blended with brandy which gives it a more distinctive flavour. This could be a distraction in a margarita mix so I would avoid it. So the choice between a triple sec and Cointreau is down to personal preference. In the recipes I put triple sec but I use both depending on how the mood takes me! I hope that you have picked up some useful tips and information in this article. The video clip I have included is of a classic scene in Thelma and Louise that makes reference to a margarita. Having just viewed the clip I feel rather inspired to watch the film again, with margarita in hand of course! 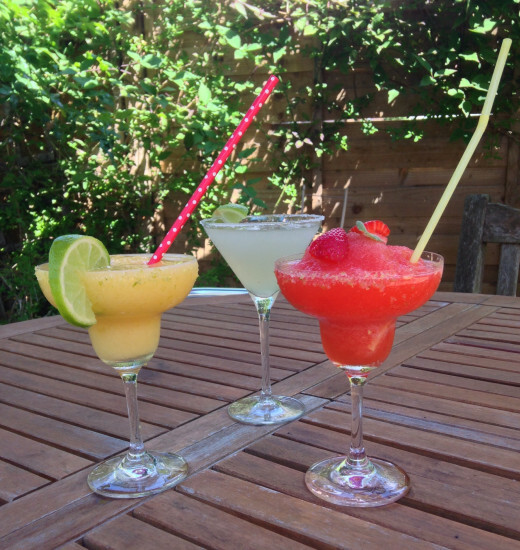 Enjoy making and drinking your margarita cocktails! Watch out for the brain freeze! 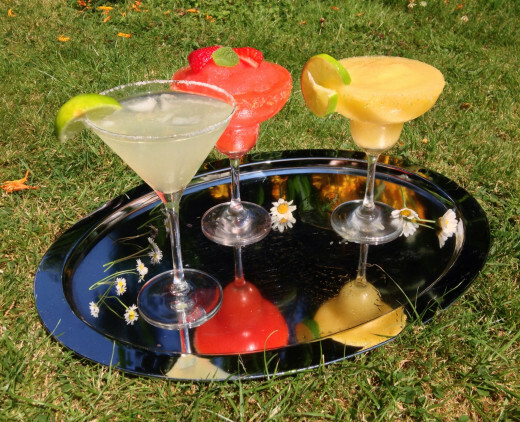 Which is Your Favourite Margarita? Those recipes all sound so yummy! And the pictures for them LOOK yummy! Thanks for sharing! These look yummy! Thanks for the tips! Does sound rather tempting. May give that one a go over the bank holiday! Cheers AliciaC, it really is great fun making your own cocktails and of course drinking them afterwards. The kitchen ends up looking like a disaster area afterwards though! But perhaps that's just me! I normally order it at restaurants, but I hear it has coconut tequila, cream of coconut, pineapple tidbits, pineapple juice, lime and obviously blend with ice. I am sure there are tons of different ways to do it though. Thanks for sharing the useful information. Your hub was especially interesting for me because I don't drink alcohol very often and don't know very much about the popular beverages. I enjoyed learning about margaritas by reading your article. The photos are lovely, too! Well that's one I haven't tried! Does it use tequila as well as rum? Great Hub! Wonderful recipes! My favorite is frozen pina colada margaritas. 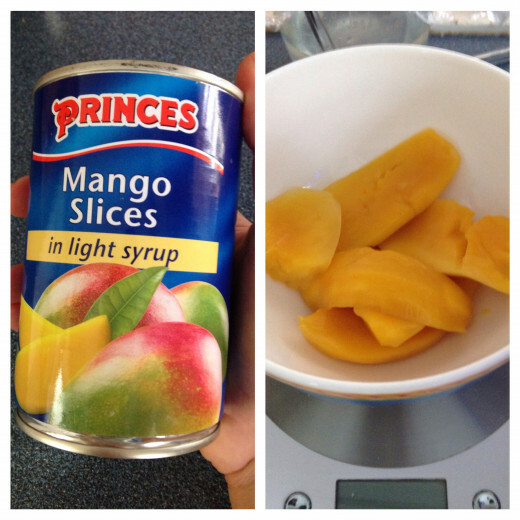 But the classic and mango is a close second.